The Lagoon Nebula glows pink. Image released Jan. 22, 2014. A pink lagoon glows in the Milky Way. New photos taken by a telescope in Chile put the Lagoon Nebula — a giant cloud of gas and dust located 5,000 light-years from Earth — on rosy display. The Lagoon Nebula (also called Messier 8) is about 100 light-years across and harbors young stars that shine brightly in the image, according to European Southern Observatory officials. The VLT Survey Telescope in Chile captured the picture, taken as part of a sweeping set of surveys designed to unlock mysteries of the universe. You can watch a video flythrough of the new Lagoon Nebula image from ESO, based on the new VLT telescope images. "History shows that surveys often find things that are unexpected and these surprises are crucial for the progress of astronomical research," ESO officials added. The Lagoon Nebula gets its name from a lagoon-shaped dust trail that winds through the glowing gas, and this isn't the first time ESO has imaged it. The observatory's Visible and Infrared Survey Telescope for Astronomy captured the nebula in stunning detail in infrared light, giving the cosmic wonder a different kind of glow. A wider view of the Lagoon Nebula and its surroundings reveals other nebulas in a lush patch of sky. The Lagoon Nebula glows orange in the middle of the image, and the Trifid Nebula at the top of the picture and other nebulas glow with the central nebula as well. 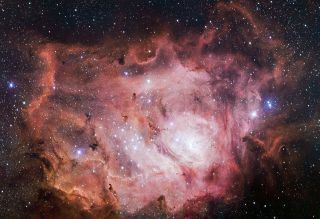 ESO has also imaged the Lagoon Nebula before, looking at it in infrared light with its Visible and Infrared Survey Telescope for Astronomy in Chile. ESO is operated by 15 different countries and is the most productive ground-based astronomical observatory in the world, according to ESO officials.